Experience exceptional services at this 2017 TripAdvisor Certificate of Excellence Award winning Paso Robles hotel located near California's Central Coast wineries and Mission San Miguel. The Best Western Plus Black Oak is situated at the gateway to California's Central Coast, midway between Los Angeles and San Francisco. Guests will enjoy being close to over 250 Paso Robles area wineries as well as Hearst Castle, Lake Nacimiento and the Charles Paddock Zoo. This Paso Robles hotel also provides convenient access to many of the area's favorite events including the Vintage Paso Festival, Western Bonanza Livestock Show, Paso Robles Wine Festival, and more. Corporate travelers will be minutes away from Camp Roberts Military Base, Specialty Silicon, Fort Hunter Liggett, IQMS and Applied Technologies. Best Western Plus Black Oak is the closest hotel to the Paso Robles Event Center. Home of the California Mid-State Fair, various horse shows, not to mention a variety of home events and antique shows throughout the year. Every guest will receive friendly customer service and that extra special touch to feel like family. Special amenities to help guests unwind include an outdoor heated swimming pool, hot tub and steam room, elevator, fitness room and The Acorn room for small meetings and gatherings. For convenience while staying in Paso Robles, the hotel offers an on-site laundry. Each room features a refrigerator, microwave, free high-speed internet access and HD cable television with HBO . This Paso Robles hotel offers many great dining options: Margie's Diner, on-site, Good Ol' Burgers, Tortilla Town, Big Bubba's Bad BBQ , Rustic Fire Pizza, and Starbuck's all within walking distance. 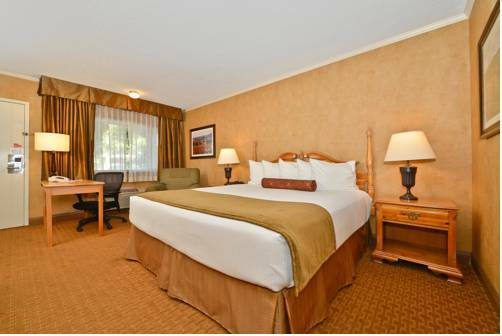 For the best service and accommodations in Paso Robles make a reservation at the Best Western Plus Black Oak. Welcome to Best Western. Enjoy your stay. Good Ol' Burgers: Adjacent to Good Ol' Burgers, fast food, American, open for: lunch, dinner, burgers, salads, sandwiches, hot dogs, wraps, shakes, fries and hand cut, dipped onion rings. Good food! Big Bubba's Bad BBQ: Adjacent to Big Bubba's Bad BBQ, fast food, American, open for: lunch, dinner, Ribs, chicken, burgers, sandwiches, salads. Appetizers and desserts. Full bar with televisions, open 11:00 a.m. to 10:00 p.m. Ride the mechanical bull! Outdoor pool - Outdoor pool Heated open 9:00 a.m. to 10:00 p.m. Hot tub - Hot tub open from 9 a.m. to 10 p.m.
Weightlifting - Weight lifting equipment Free weights from 5 to 50 pounds, universal weight machine. From: The north. Take US 101 South to the 24th Street/Fresno Bakersfield SR 46 East (Exit 231B), turn right, west. The Best Western Plus Black Oak is one block on right side, just past Starbucks . From: The south. Take US 101 North to the 24th Street/Fresno Bakersfield SR 46 East (Exit 231), turn left, west. The Best Western Plus Black Oak is one and a half blocks on right side, just past Starbucks . From: The west. Take SR 46 East to US 101. Take US 101 North to the 24th Street/Fresno Bakersfield SR 46 East (Exit 231), turn west. The Best Western Plus Black Oak is one and a half blocks on right side, just past Starbucks . From: The east. Take SR 46 West. Follow signs for Lake Nacimiento. The Best Western Plus Black Oak is 1.5 blocks on right side of street after you go under the US 101 overpass. Just past Starbucks .